In 1327, Konopiště became property of the Sternberg house for 275 years. In the 17th through 19th century, the castle passed from one important aristocratic house to another: first the Hodějov house, then, in a short spell after the Battle of White Mountain, Albrecht of Wallenstein, then the Michnas of Vacínov, the Vrtba house, the Lobkowicz etc. The medieval castle structure was modified for the first time in the end of the 15th century by George of Sternberg, and then in the early 17th century by the members of the Hodějov house. The Vrtba house turned Konopiště into the baroque residence in the 18th century. In 1887, the Lobkowicz sold the chateau and the whole domain to Franz Ferdinand d'Este, heir presumptive since 1896. The archduke had the castle rebuilt in the faux-historical style, and turned its surroundings to a landscape park. The former baroque garden turned into the Rose Garden with greenhouses. Franz Ferdinand installed his large art collections in the chateau; the collections were partly inherited from his Italian ancestors, and partly bought. In June 1914, Franz Ferdinand attended the moves of the Austrian army in Bosnia, and on June 28, he and his wife Sophie were assassinated by Serbian anarchist Gavrilo Princip. A month after the assassination, Austrian Emperor Franz Joseph declared war on Serbia. 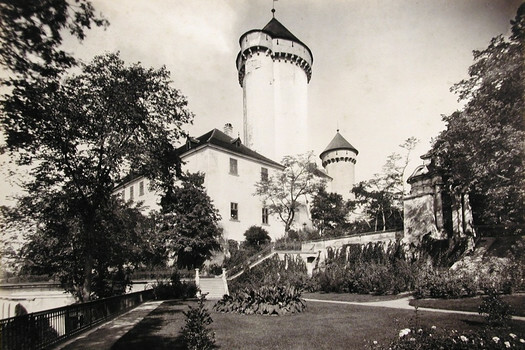 In 1921, Konopiště was taken over by the Czechoslovak government from the archduke’s heirs, and a part of the chateau with the park became accessible for public. During WW2, the headquarters of SS units were located here. After the liberation, public access was restored. The castle has been preserved in the design after the last reconstruction made by Franz Ferdinand d'Este. Also the internal equipment became basically the same. Nowadays, the chateau is managed by the National Heritage Institute, Prague section.